The OSU Extension Franklin County team supports the City/County Local Food Action Plan. 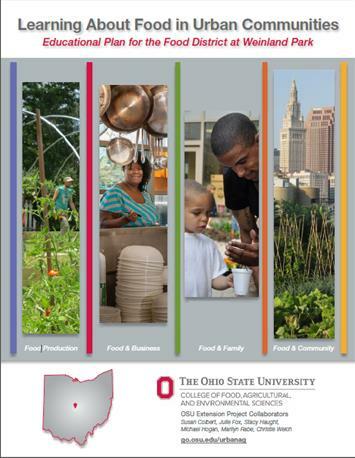 The Ohio Master Urban Farmer course was designed to help individuals learn how to produce and market all types of food products in urban settings. In Franklin County 44 completed the course and 18 in Summit County. In Franklin County Master Gardener volunteers provided leadership for food gardening projects which donated a total of 10,386 pounds of vegetables to food pantries and hunger-relief organizations. Produce Perks is a partnership between OSU Extension – Hamilton County and the City of Cincinnati Health Department. The goal of Produce Perks is to increase consumption of fruits and vegetables for those who participate in SNAP. For every $1 spent on local produce using SNAP, participants receive $1 produce free. This resulted in 7,266 tokens being redeemed. Cuyahoga County has the largest farmers’ market network in the state with 37 neighborhood farmers’ markets that have more than 200 food producers. Nearly 18,000 print copies of Extension’s 2016 Columbus Local Foods Guide were distributed to Columbus residents. During the Columbus Urban Farm Tour series, more than 200 individuals learned about urban farming at five tour locations. Stanard Farm is an urban farm developed on the site of the former Stanard Elementary School at East 53rd and Stanard streets. The farm was created in collaboration with the OSU Extension Service, the St. Clair Superior Development Corporation, Councilman Joe Cimperman, and the city of Cleveland. OSU Extension staff provide agricultural training and employment opportunities along with volunteers from its Master Gardeners program. The subject of local foods is a broad critical issue that affects every Ohioan and is of great public interest and need. Local foods programming includes issues related to food production, marketing, human nutrition, economic development, and others. OSU Extension faculty and staff are currently conducting local foods programs on many of these issues. In 2015, Brian Raison was recognized as Individual Runner-up for the NACDEP Educational Materials Award for his TEDx Talk: Be a Local Food Superhero.